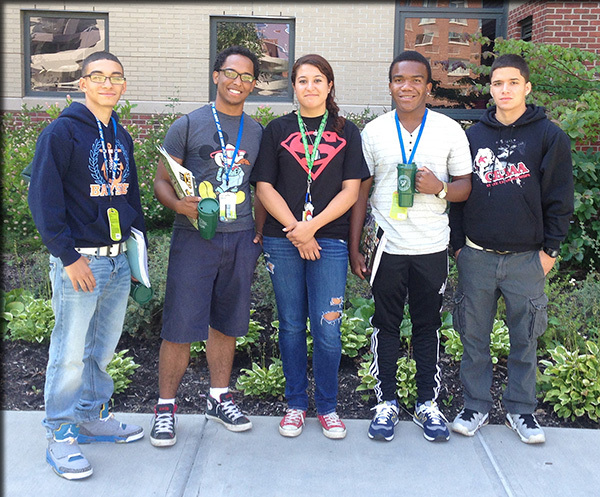 First-year students, from left, Justin Vargas, Christopher Cruz, Leia Scalley, Derrick Rice and Cornelius Rosario joined the rest of the incoming students for orientation Aug. 19. These students had arrived on campus three days earlier to participate in pre-orientation activities. A beautiful summer day greeted the more than 330 freshmen who officially became ESF's newest students Aug. 19. The freshman class is the largest in the college's history and keeps up with ESF's reputation for being both culturally diverse and academically gifted students. Centennial Hall was abuzz with activity as new students, with their families' help, began moving in early in the day. Between dodging stacks of boxes and nervous-looking parents, the new students seemed to collectively radiate the same feelings of apprehension and excitement about beginning their college careers at ESF. Chris Cruz, a wildlife science major from Queens, N.Y., shared his eagerness to "learn more about the environment" and "how to get more people interested in learning about the environment and wildlife." Sonia Mensah, an environmental biology student from the Republic of Ghana who moved to North Syracuse a few years ago, said, "I hope my classes are challenging but fun." Her friend Shewa Shwani, also an environmental biology student, added that ESF offered a "smaller but more diverse atmosphere" in comparison to other colleges. Roommates Allie Holmes and Rachel Feeney, both studying aspects of natural resource management, were excited about beginning classes Aug. 25. When asked what she liked about ESF so far, Holmes exclaimed "Everything! The atmosphere is really unique and different." Perhaps Feeney's father best summed up the new students' enthusiasm by describing the two as "a couple of sponges" waiting to soak up as much as they could from ESF. Before classes begin, first-year students are busy familiarizing themselves with the ESF campus and participating in various activities to ease the transition into college life.